This recipe was shown on 'Blue Peter' about 25-30 years ago. It has been a family favourite ever since. We have introduced it to many family friends over time and now everyone we know seems to make it! It is so easy to make and truly delicious. In the pictures here, I have used 75% dark chocolate with strawberry filling. 3-4 small chocolate blocks per banana, from a plain or milk or any other flavoured chocolate bar of your choice. 60-70% chocolate is better, because bananas are quite sweet. Place each banana flat on a work surface and make a slit along its length, using a sharp knife. Cut up chocolate into pieces. Stuff 3-4 or more pieces of chocolate into each banana by pushing the chocolate into the flesh. Push the banana close. Wrap each banana individually in aluminium foil. At the end of the BBQ, when the fire is dwindling, place bananas on the coals. Leave for 15-20 minutes or longer. You can also cook them in a hot oven, around 200C, for 15-20 minutes. 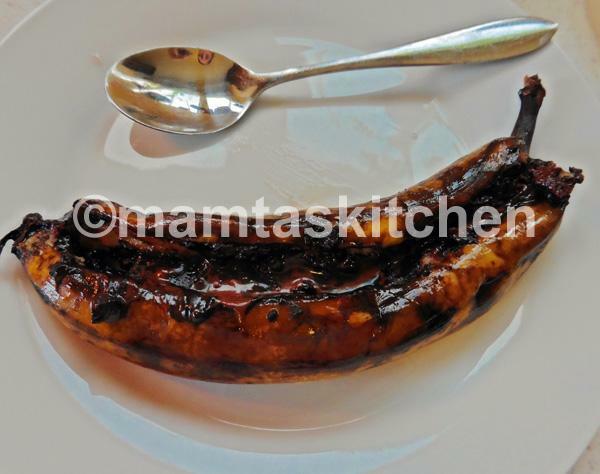 Serve with a teaspoon, to scoop out the cooked banana flesh covered in yummy, melted chocolate! You can serve double cream or vanilla ice-cream with it, but bananas are quite good on their own. It is a good idea to have a few extra bananas, people often come for more! If you have any unusual BBQ recipes, please share them with me, via contact link. If it is good, I will add it to the site, with you as the author.